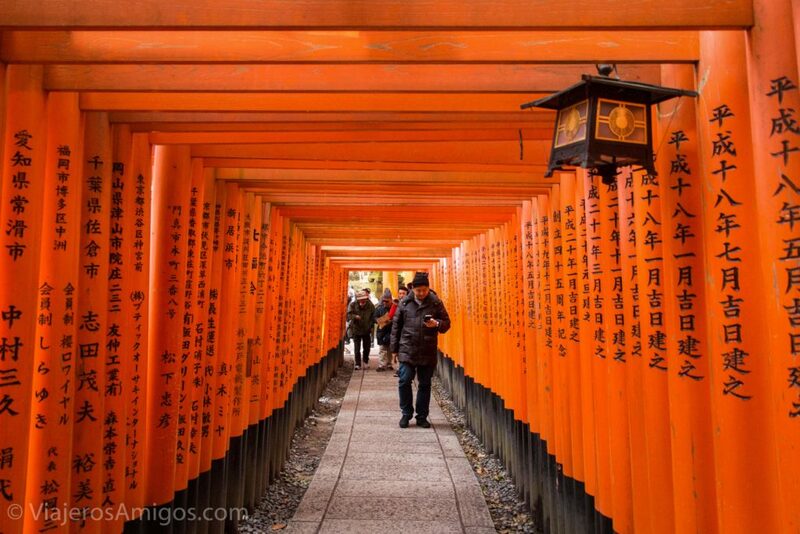 ﻿The Famous Fushimi Inari Shrine of Kyoto - Viajeros. Amigos. 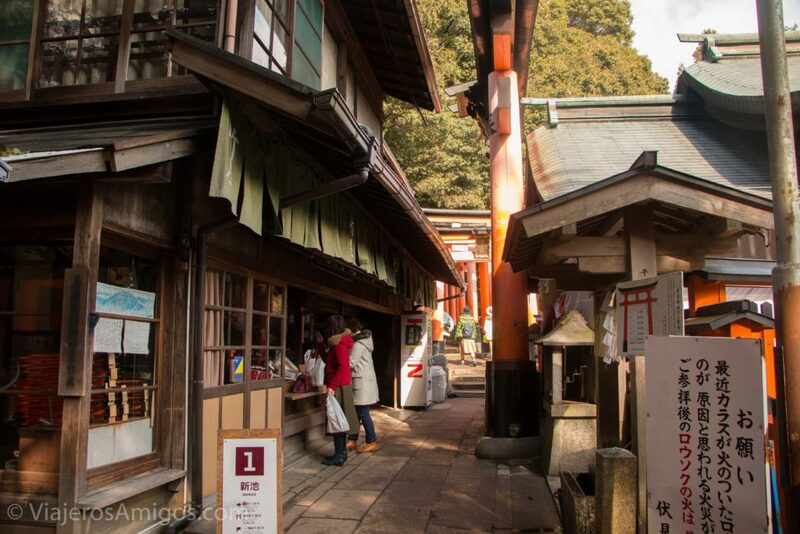 This is our third post on the medieval Japanese city Kyoto. You can read Part 1 here and Part 2 here! 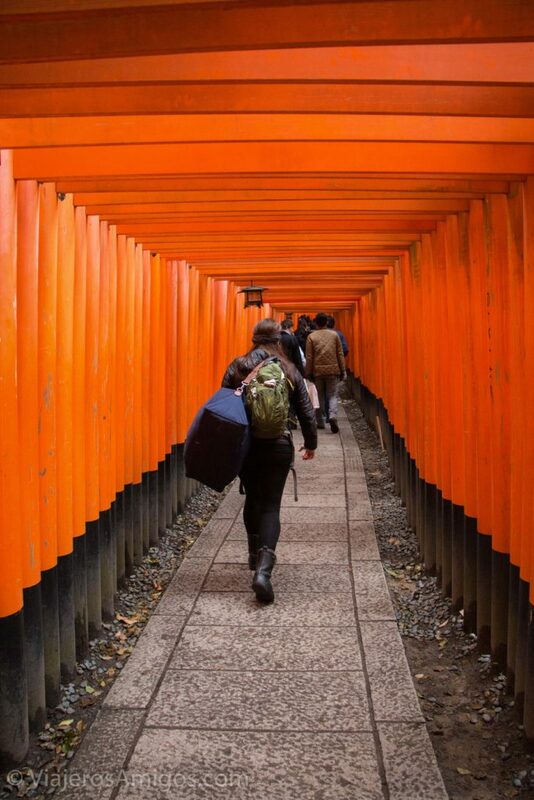 We’ve all seen photos of Fushimi Inari. 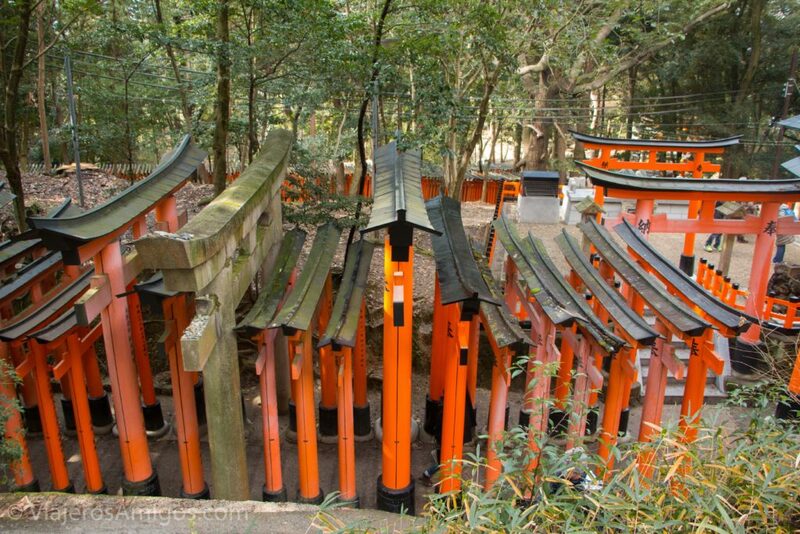 It’s the one with the never-ending rows of vermillion gates known as “torii”. 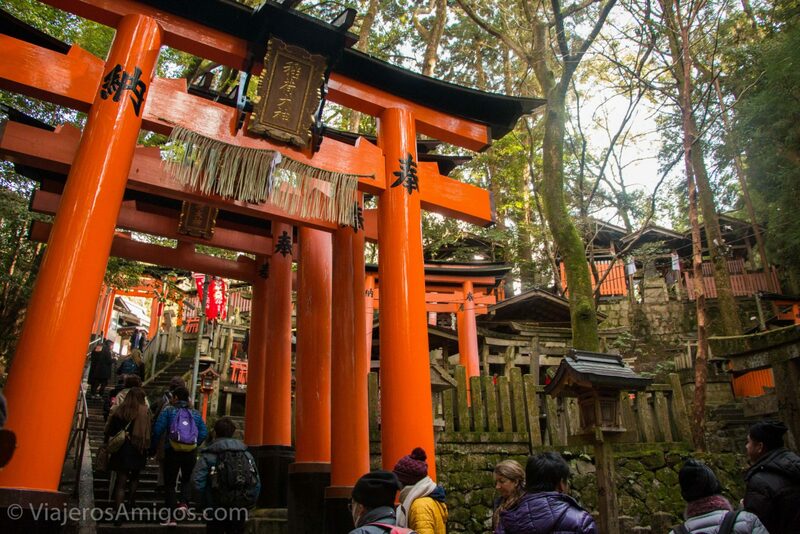 These gates are an important feature of Shinto shrines as they are viewed as a gateway to the sacred world. 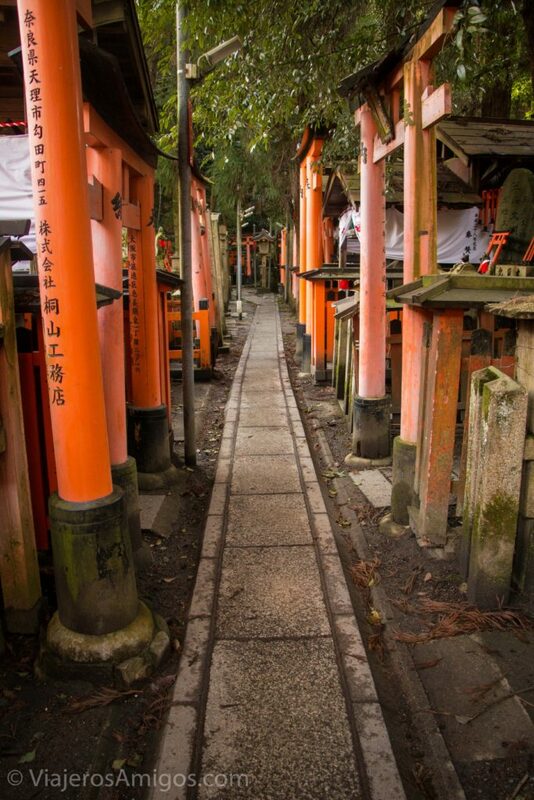 Fushimi Inari is a massive shrine dedicated to the kami Inari. 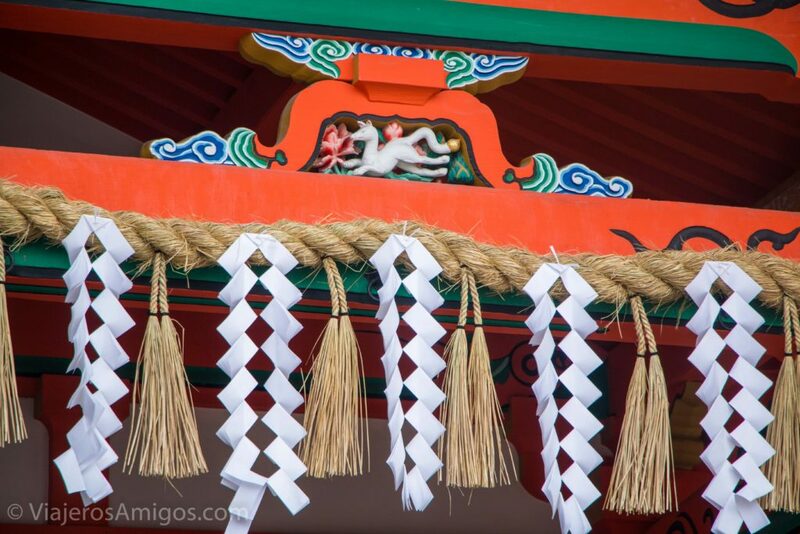 Kami are Shinto spirits. In Western civilization, we could probably compare them to Greek and Roman deities and how they have specific things that they are gods of. 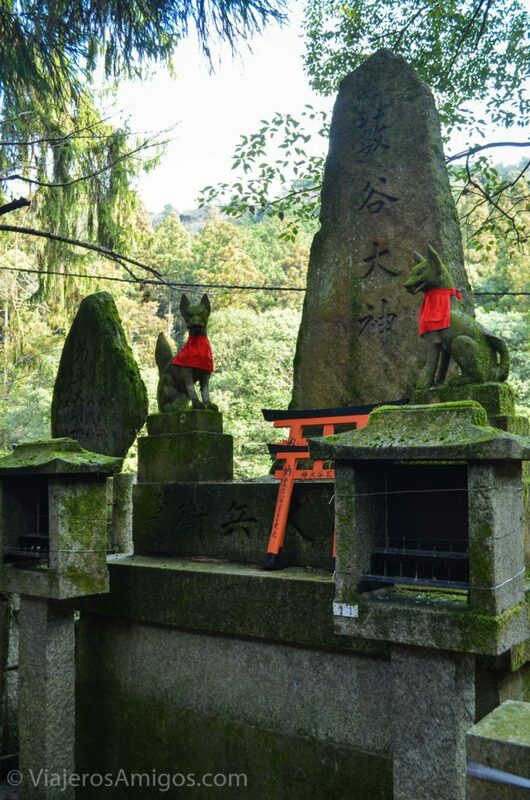 At many Shinto shrines, there will be statues of a fox-like creature. 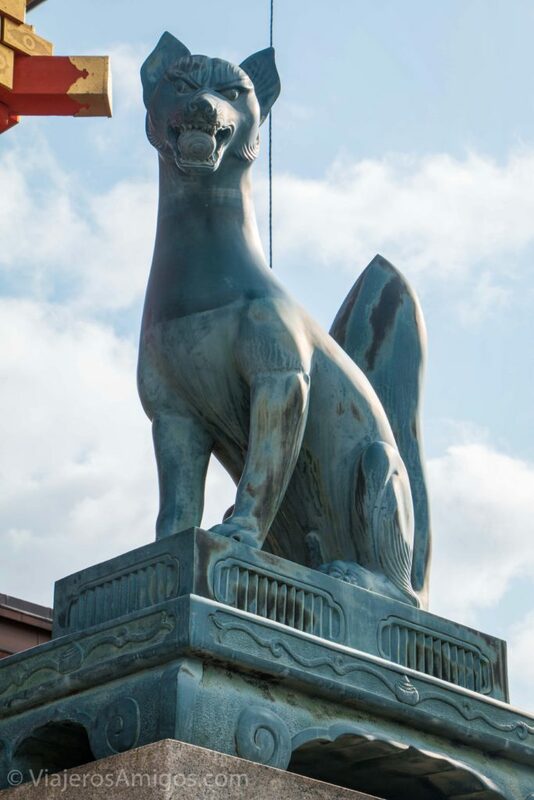 This is Inari. 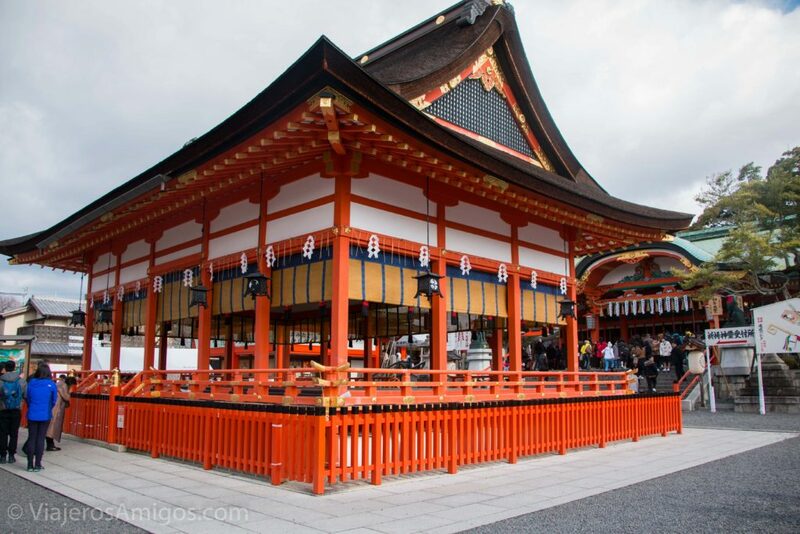 The Fushimi Inari-taisha is the most famous of the Inari shrines. 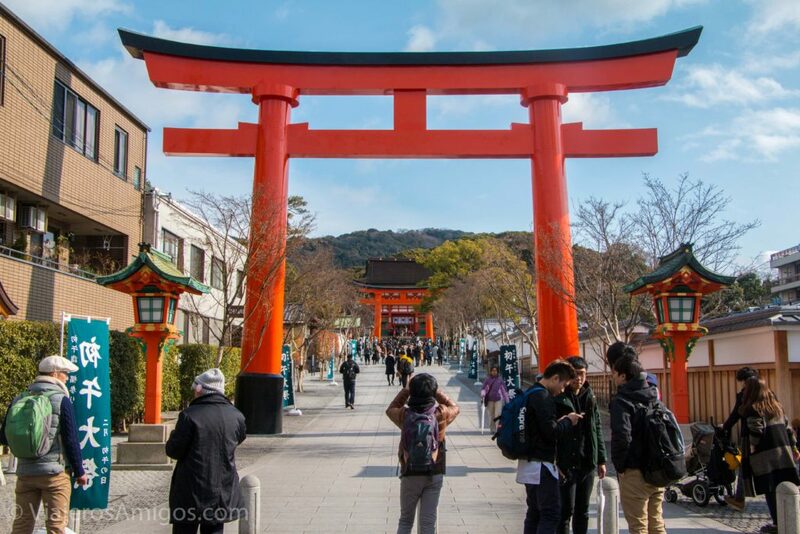 The entrance way is marked by a gigantic torii, followed by a few buildings in the main plaza in which to make offerings. 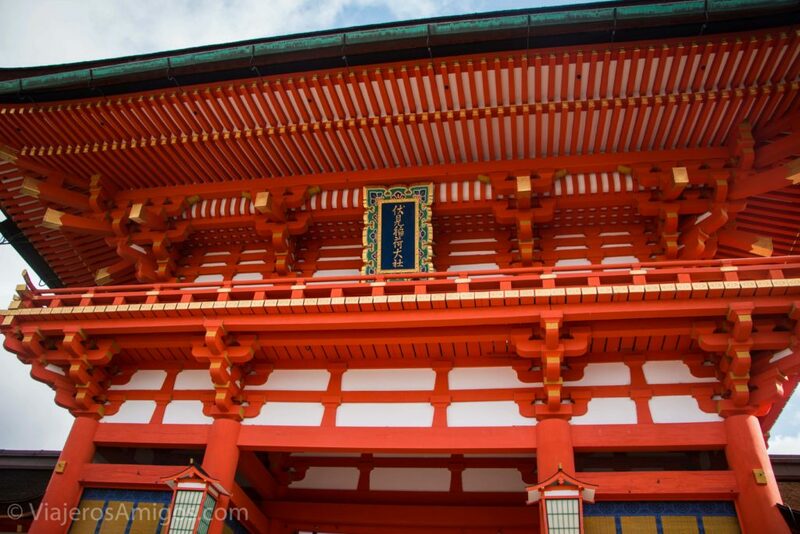 The architecture here alone is worth the trip as there are lots of details to admire. 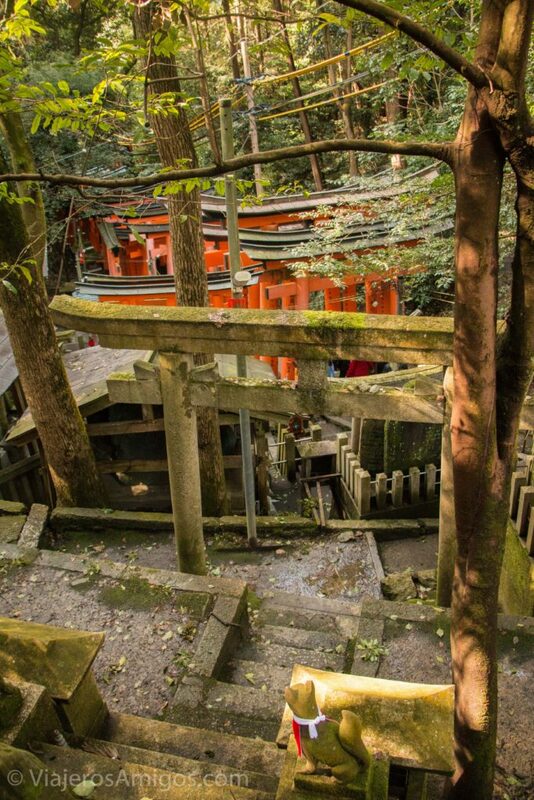 Japanese carpentry is a craft to be appreciated. 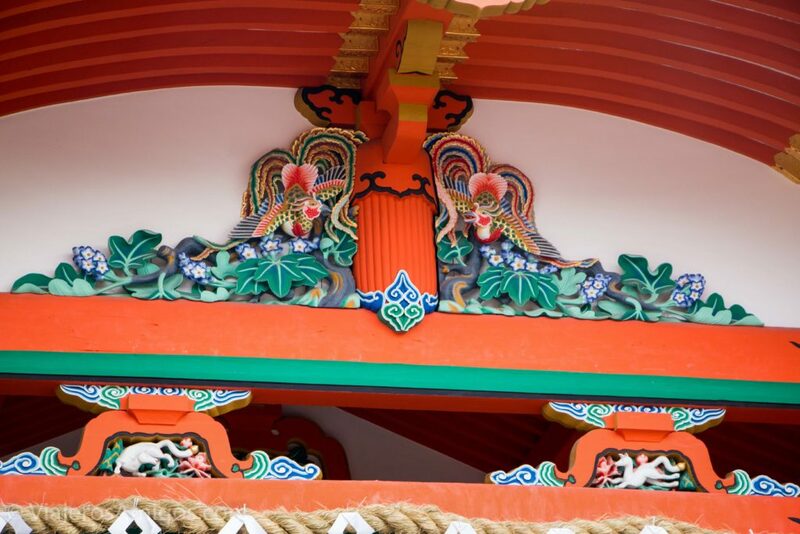 Some of the architectural details. 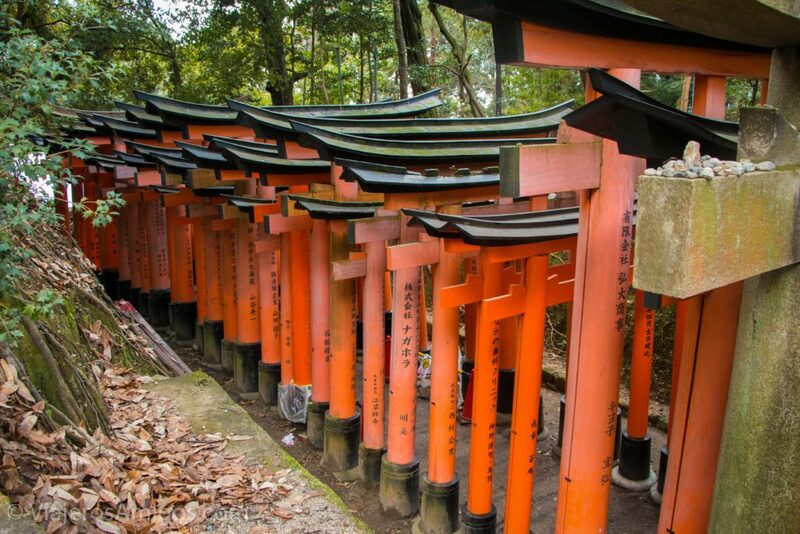 The most known part of the shrine is the thousands upon thousands of torii gates lining the paths. 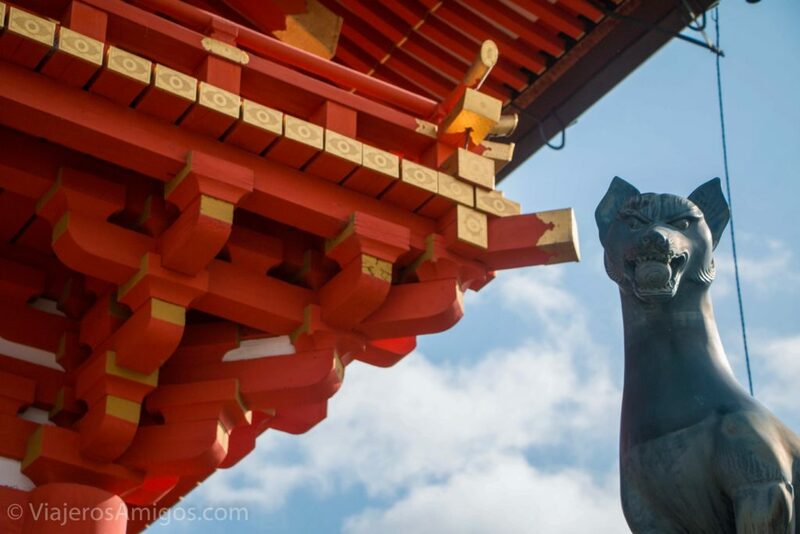 As Inari is also known as the kami of industry, businesses purchase torii gates to donate to the shrine with their name and the date of the donation. 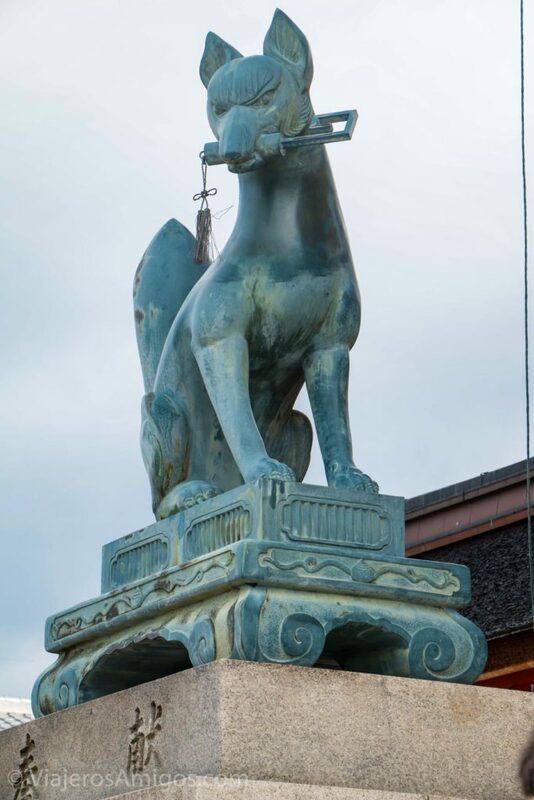 As long as businesses continue to do so, the shrine will continue to be one of a kind. 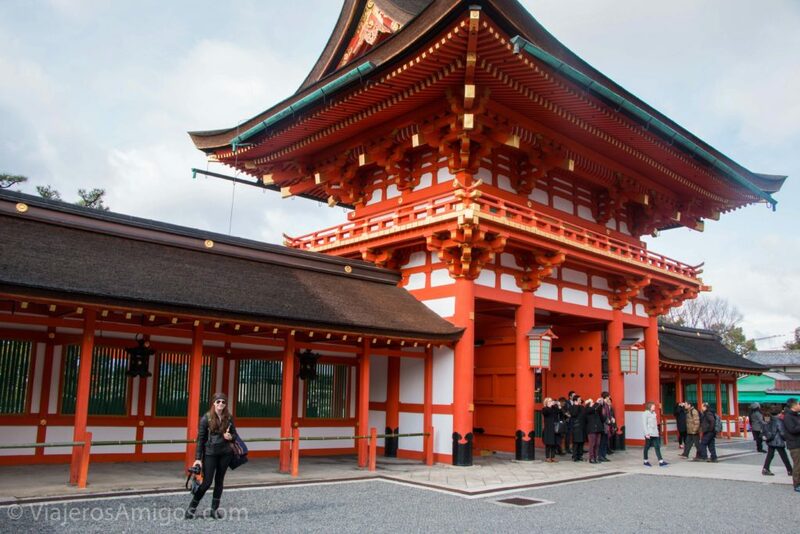 We took the subway from Maruyama Park after a morning spent in Gion. 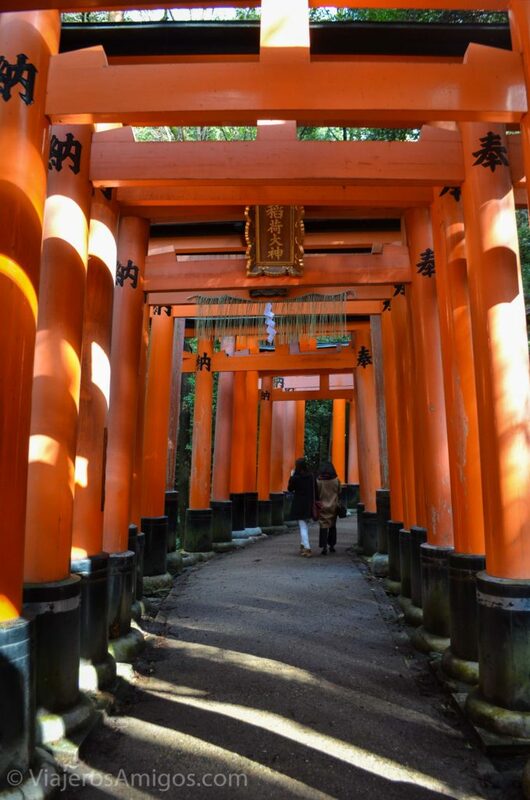 We walked around the paths, admiring all of the torii and taking photos. 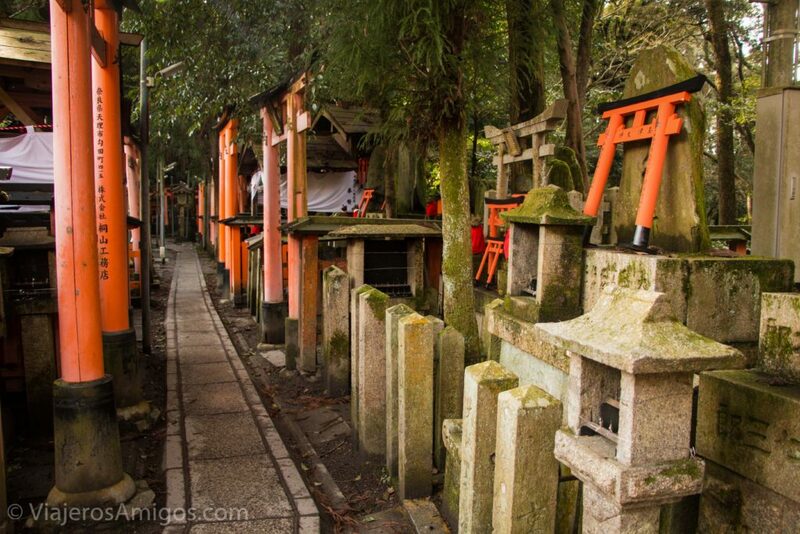 These paths continue 2 miles up Mount Inari and are a 2-3 hour walk up to the top and back. 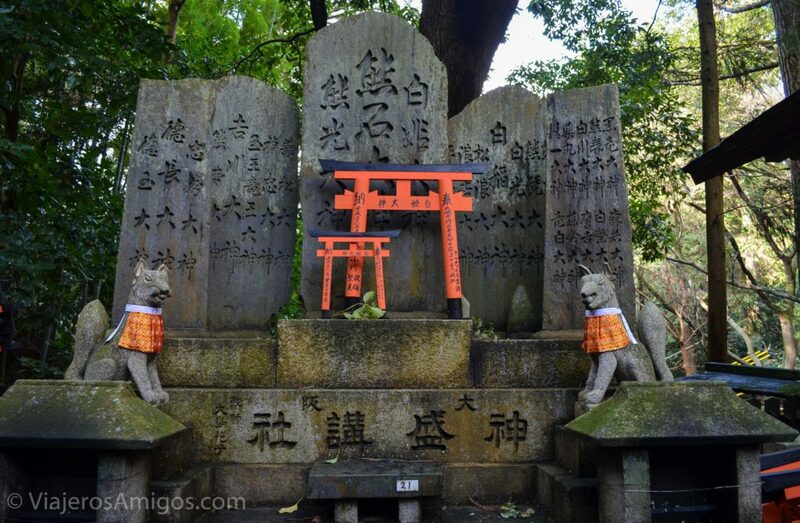 We didn’t have time for that, so we turned around a little bit into the shrine. 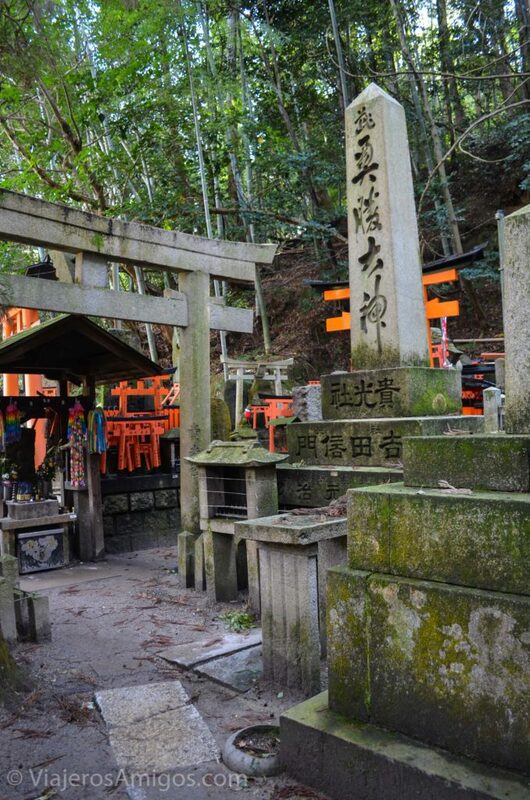 Along the various paths, there are a few places to purchase mini torii to leave as offerings. I almost bought one to bring home, but I figured it would be inappropriate as it is a sacred site. 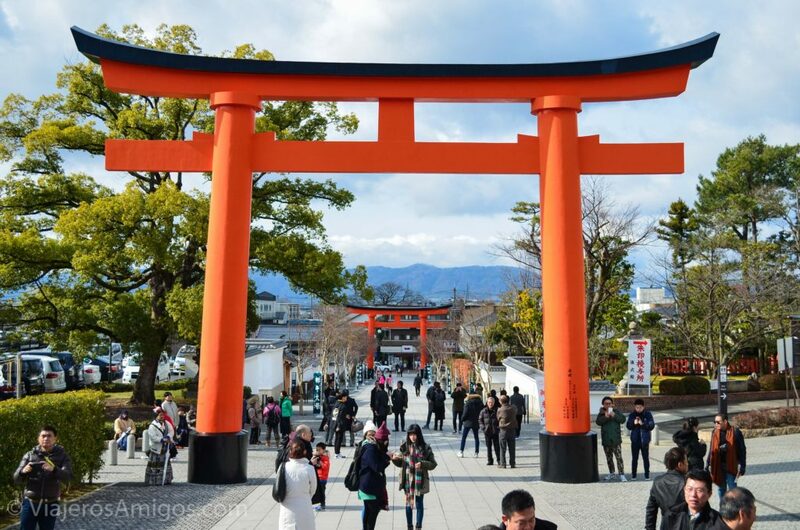 Fushimi Inari shrine can be accessed by the JR Inari station along the JR Nara Line. 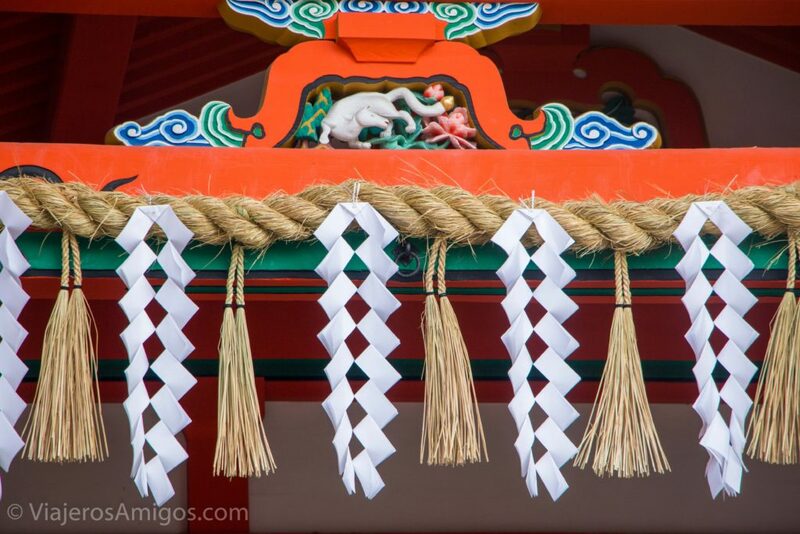 Admission to the shrine is free and it is open 24 hours a day. Looking back toward the street. 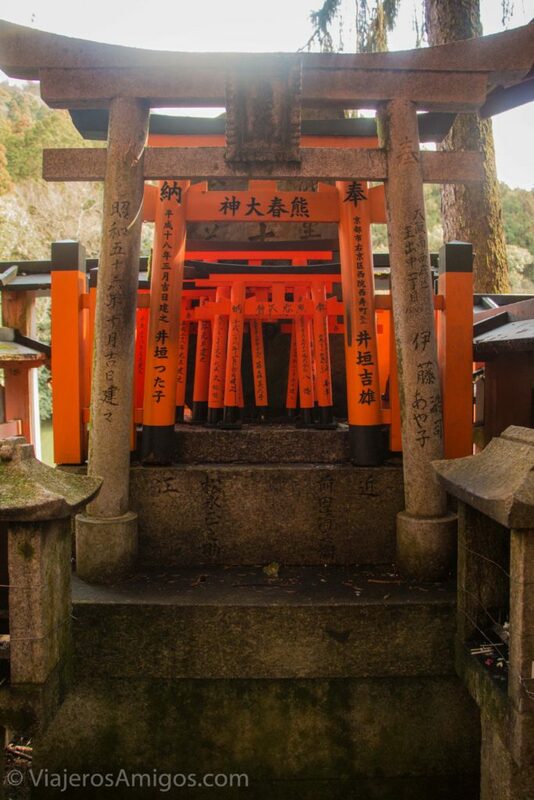 One of the buildings selling torii offerings. 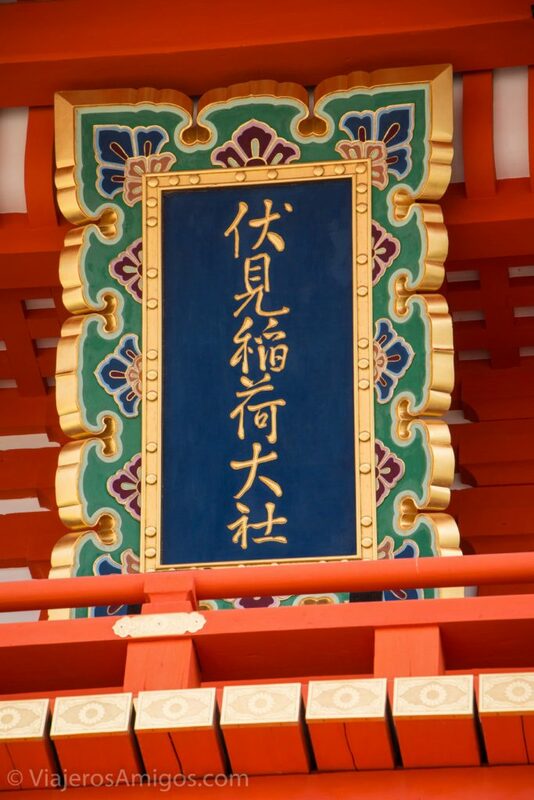 So that’s the end of our Japan posts. 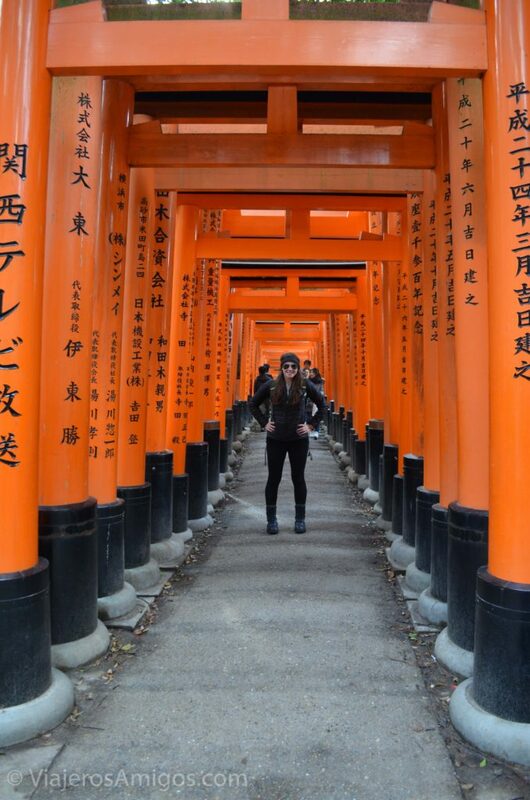 It took us way too long to finish up the posts, but life continues. We hope you enjoyed!!! 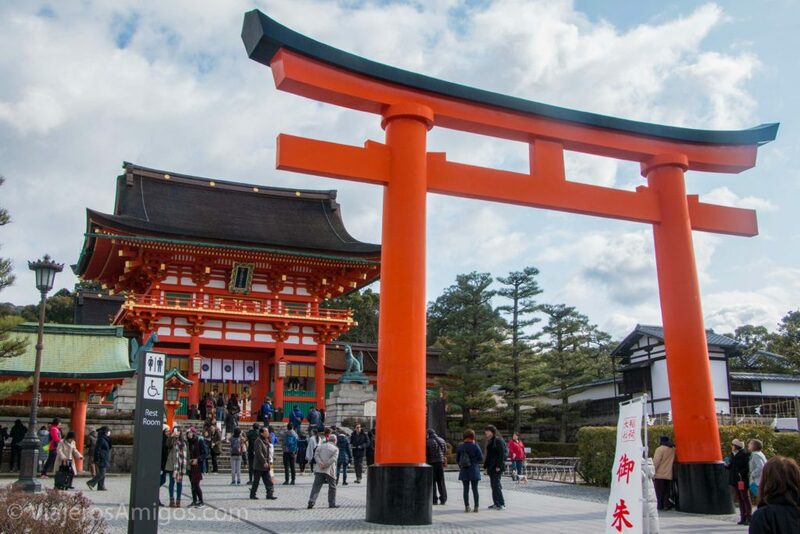 Pingback: Visiting Kyoto Part 2 - Viajeros. Amigos.